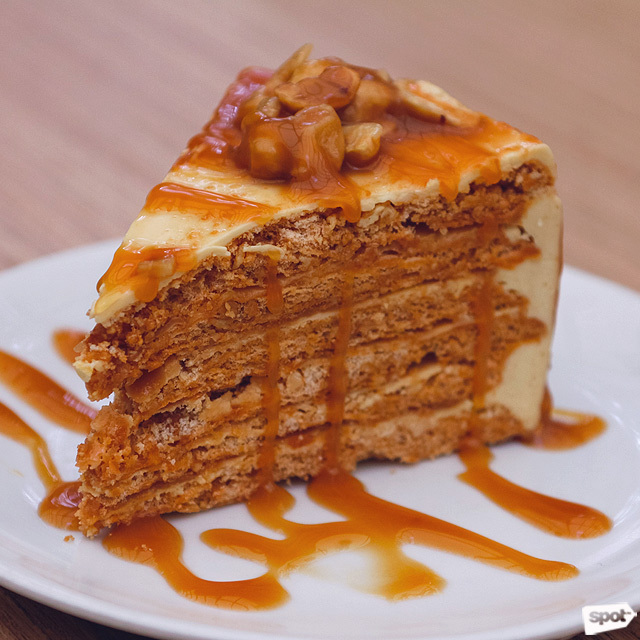 (SPOT.ph) A mainstay in most dessert shop’s flavor rosters and all-in-all a timeless treat, nothing can get any more classic than caramel. The bewitching transformation of sugar heated to scorching temperatures, the outcome is deep, bitter, and complex—its burnt belligerence soothed by the creaminess of dairy. It may shine as a standalone flavor in its own right, but it also works its magic in the background, complementing other flavors beautifully without stealing the spotlight. 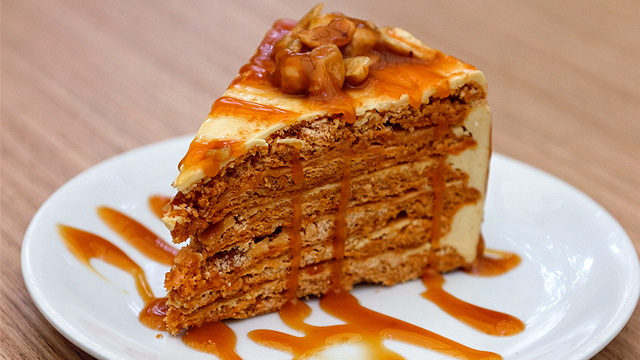 Here, we showcase caramel's versatility, its adaptability to various forms, and its overall undying allure, as represented in 10 of Manila’s finest desserts. This award-winning dessert (it is among Yummy magazine’s top 50!) poses a serious challenge to the old adage of "if it ain't broke, don't fix it." 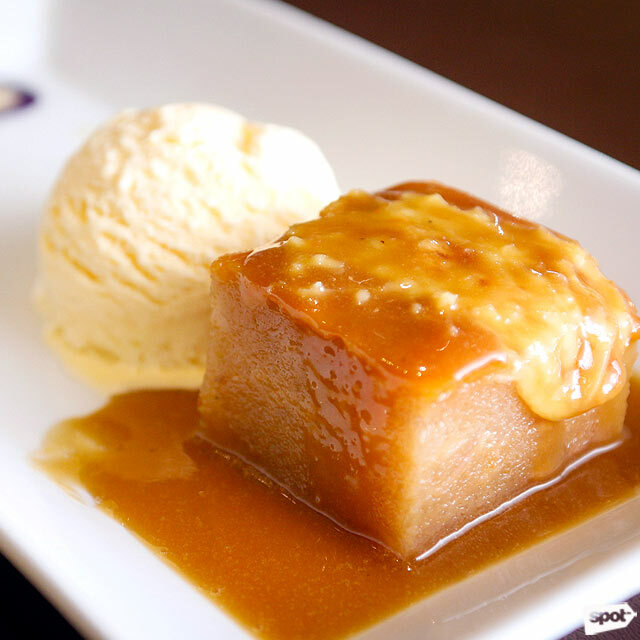 Good ol’ sans rival just got a whole lot sexier, thanks to a generous helping of caramel sauce that envelops this sans rival’s surface and dribbles down its sides. Sticky and seductive, it blends in seamlessly with the rich buttercream and the natural sweetness of cashews. With such an eye-popping selection at this Hong Kong-based patisserie, it’s easy to overlook this modest-looking pastry. But don’t—there’s more to it than meets the eye. Two layers of pastry cream—sweet, cherubic vanilla on one, sinfully dark caramel on the other—glide between sheets of puff pastry, itself lightly kissed with burnt sugar on the surface. 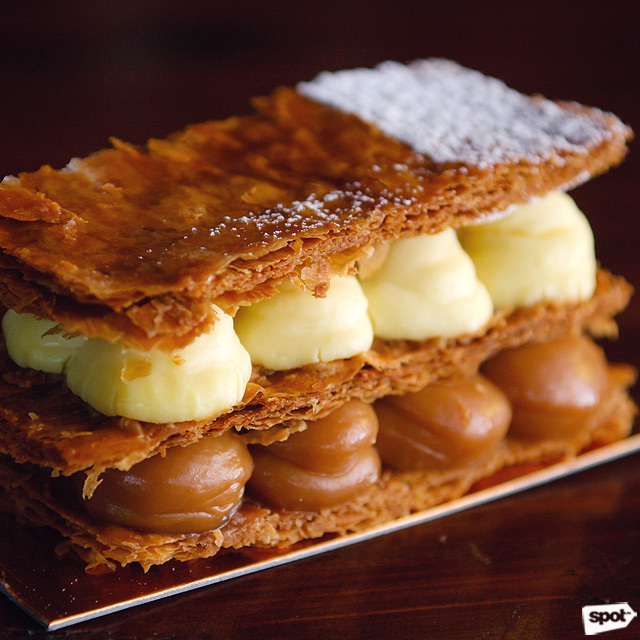 It is a challenge to eat this gracefully as it collapses with the plunge of a fork, but it all combines beautifully: the crisp with the creamy, the smooth with the flaky, and the deep undertones of caramel that keep every bite enthralling. Passion by Gerard Dubois it at C2 NetPark, 5th Avenue, E-Square, Crescent Park West, Bonifactio Global City. A lot of chocolate-caramel confections place too much emphasis on the chocolate. 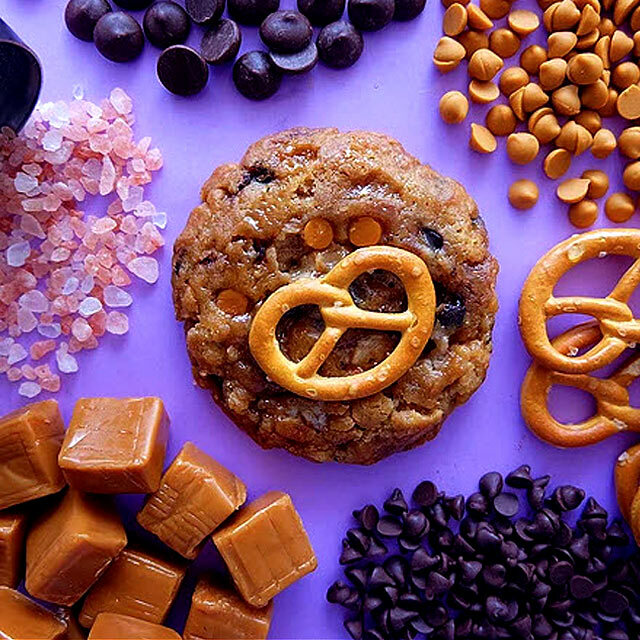 Here they find equal representation, the chocolate and the caramel bringing out the best of each other, and finishing on a salty note that ties both together. It sure doesn’t hurt that these manage to stay ultra-chewy for days. For orders, contact The Bald Baker. 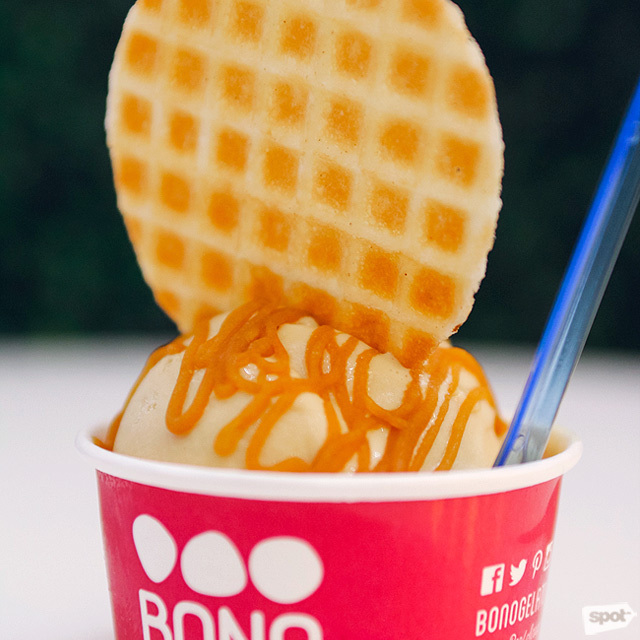 The name might sound foreign, but the flavors are closer to home: a concentrated shot of rich, milky caramel, brightened up with lime—much like our dayap-infused yema. 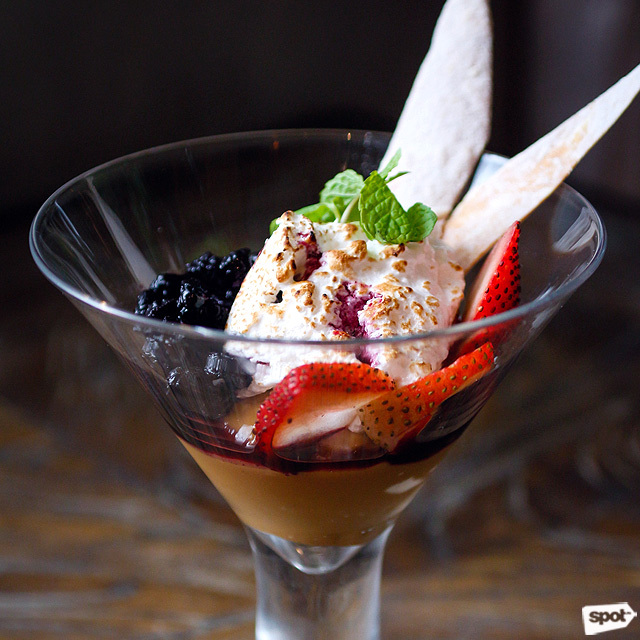 Served in a cocktail glass and topped with meringue, berries, and crackers (be sure to eat them all together! 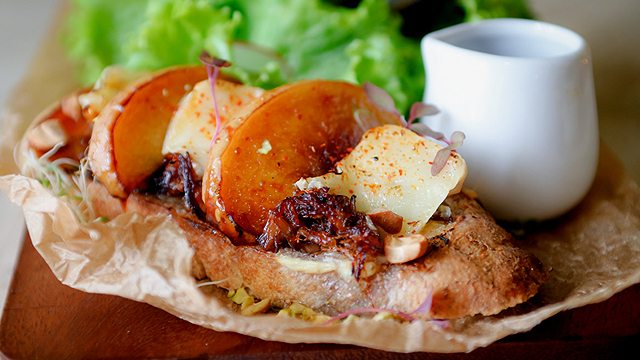 ), it just exudes chic—much like everything else in this hip, Japanese-Peruvian joint. 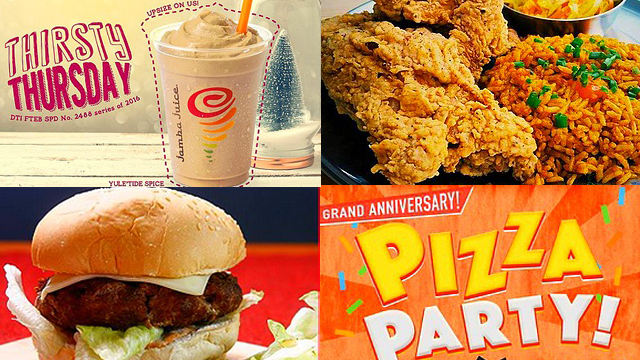 Nikkei is at Unit GO3, Frabelle Business Center, 111 Rada Street, Legazpi Village, Makati City. With caramel in no less than three forms: a gelato base with a distinctive burnt sugar note; a sticky swirl-in of salted caramel; and an extra drizzling of caramel sauce on top, this glistening, amber-hued scoop truly lives up to its name. Yet it’s surprisingly not too sweet or cloying, and the ultra-smooth texture has us swooning for days. 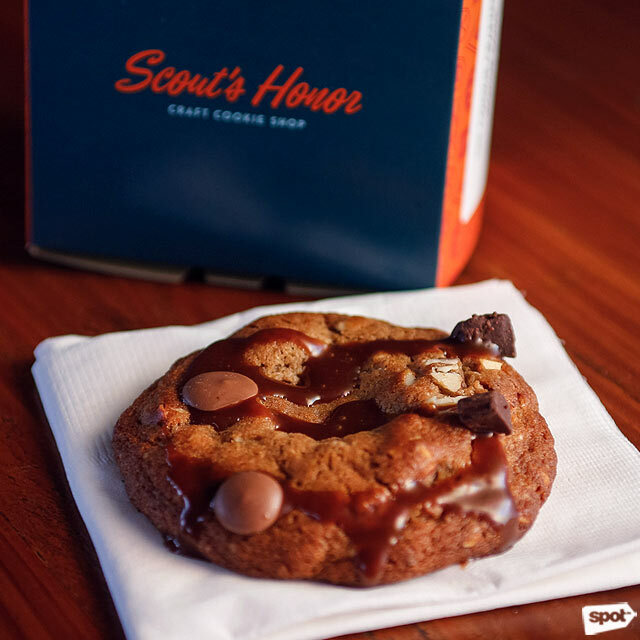 How’s this for intriguing: a Vegemite-infused cookie with milk chocolate and nuts, topped with a drizzling of salty Vegemite caramel. Shocker? Don’t knock it till you’ve tried it—caramel takes wonderfully to savory elements, and the Aussie yeast-based spread is an ingenious variation on the much more ubiquitous salt. Beyond the novelty, it lends an umami sort of depth that lingers long after the last bite. Scout’s Honor is at Hole in the Wall, 4/F Century City Mall, Kalayaan Avenue corner Salamanca, Makati City. 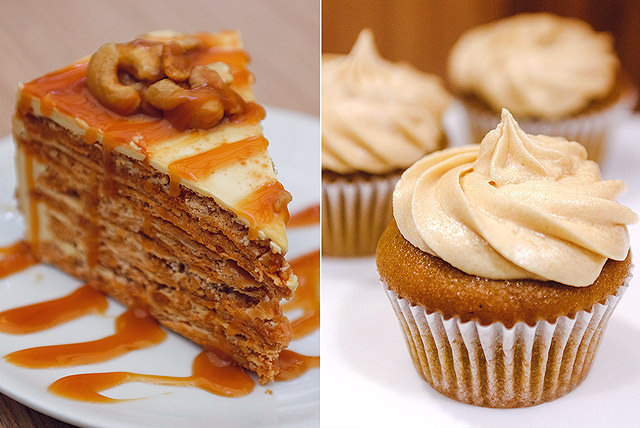 It’s about time we gave pumpkin desserts some well-deserved love here in Manila, for its appeal transcends all seasons and regions. 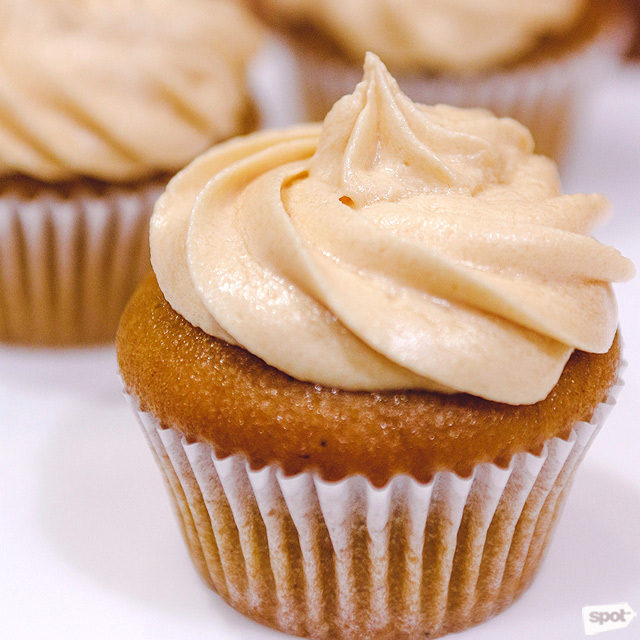 For instance: these tender, hearty pumpkin cupcakes—a nostalgic treat lightly spiced with nutmeg. But its crowning glory is the sea salt caramel frosting, which transforms the homey dessert into something utterly sophisticated. For orders, contact Kim’s Pastry Heaven. At P150 a piece (! 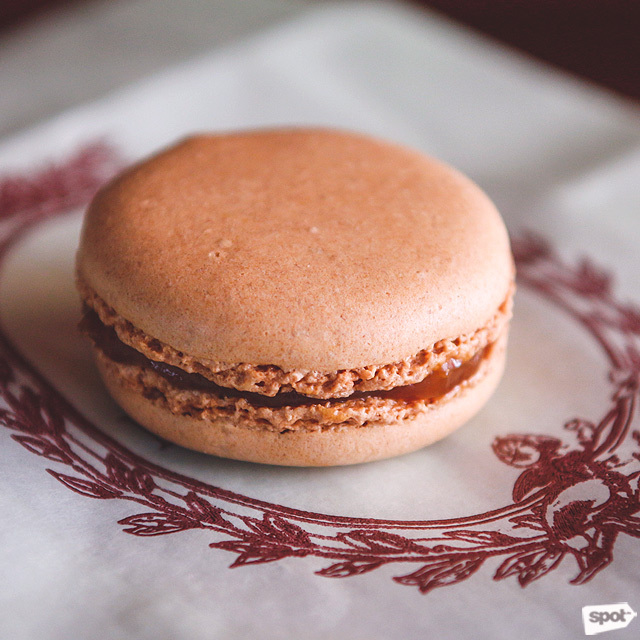 ), this macaron commands high expectations—all of which are met at first bite. Ladurée simply nails the perfect macaron texture: a shell with a smooth, sturdy exterior that easily gives way to a delicate interior, and a filling that’s velvety beyond belief. The way they do their caramel is rightfully dark and luxurious, finishing off with a hint of browned butter. Laduree is at 8 Rockwell, Rockwell Drive, Rockwell, Makati City. Joining the ranks of ice cream, cupcakes, churros, and other old-fashioned treats now getting the artisan treatment, are good ol’ doughnuts—and we couldn’t be happier. Imagine the lightest, fluffiest dough with the clever addition of lemon zest, and a billowy caramel filling that comes so generous, it oozes up and out the top. 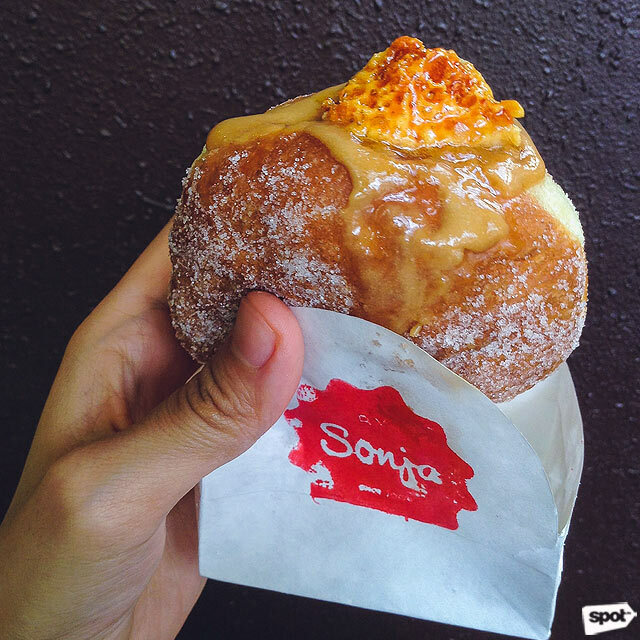 Expect nothing but the best from Sonja Ocampo, who trained with pastry chef Justin Gellatly to master the art of the fried pastry. Trends come and go, but Cassava cake remains one of our all-time favorite kakanin. XO46's pudding-y take is moist and tender within; with a mild sweetness and unique nuttiness, its affinity with caramel is inevitable. Served warm with cheese and a scoop of mantecado ice cream, each spoonful manages to be indulgent, yet comforting—an elevated ode to the merienda of the days gone by.